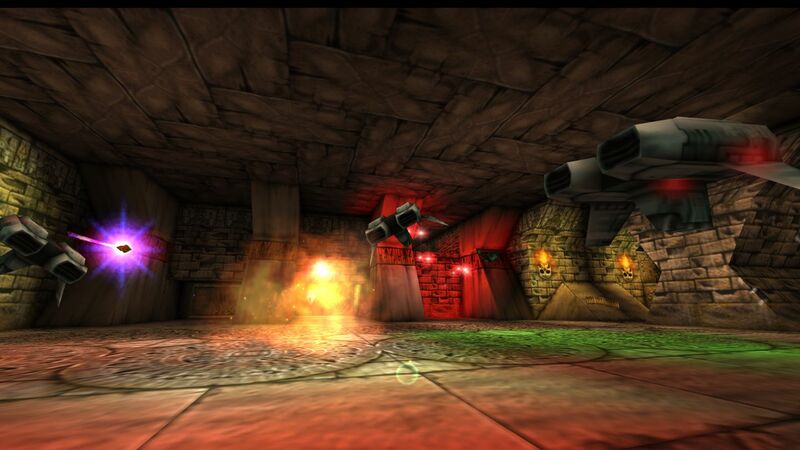 After releasing fantastic remasters of Turok 1 and Turok 2 earlier this year Nnightdive Studios is back again with another remaster of a classic N64 (and PS1 and PC!) shooter that takes us back to the halcyon days of 1998. This time the game is the 360-degree shooter Forsaken. Once again, this is not a remake but rather a remaster, so it still looks like a game from its time period, but it has never looked as sharp, ran as smoothly, or played as well as it does here in Forsaken Remastered for Xbox One. 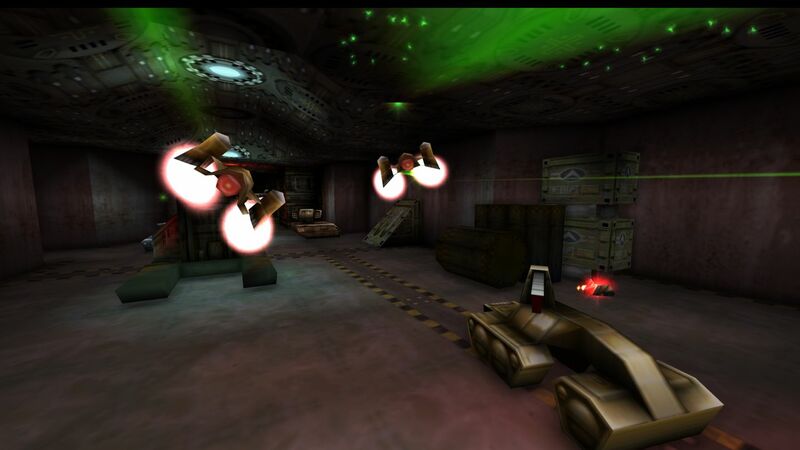 It still stands out as a unique gameplay experience even to this day thanks to its full range of movement, weapon variety, and wicked difficulty. I was a big fan Forsaken fan back in 1998 and have to say I like it even better now. Continue reading our full Forsaken Remastered review for all of the details. Originally released in 1998 for PC, PS1, and N64, Forsaken is probably best remembered by most people only for the marketing materials featuring a close up shot of a woman's face with a "Forsaken" tattoo on her cheek. Honestly, it was hard to tell what the game was even supposed to be back then based on the marketing and the fact that screenshots were usually muddy blurry messes of blocky enemies and blindingly bright bullets coming straight at the camera that gave no clues to how the game actually played (it's kinda hard to tell what's going on in screenshots of the remaster too ...). 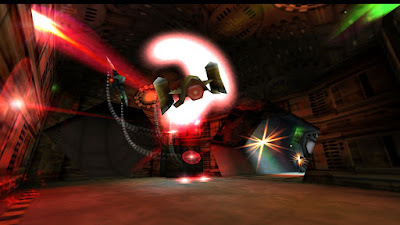 I tried the game back then based on my belief at the time that Acclaim could do no wrong on the N64 and was pleasantly surprised when I found a unique first-person-shooter with full 360-degree movement and one of the most memorable soundtracks of the generation. Fast-forward twenty years and Forsaken is still pretty darn good. Just like the Turok remasters, Forsaken Remastered looks like a cleaned up N64 game, but that is 100% the point. It looks and feels like a retro game, but has been cleaned up and improved to be the best it possibly can be. Textures are sharp, the image quality is clean, and the game runs very, very smoothly. Even better, the dual analog controls on Xbox One means it plays much better than it ever did back on the N64. This remaster also includes cheat codes (from the PC version) as well as 16-player online multiplayer. There is no local splitscreen multiplayer, unfortunately. Also, it should be noted that on a normal Xbox One S (the X1X version does have more visual options), the game doesn't have the wealth of graphical options the Turok remasters had, which is kind of a letdown. I liked playing with the options to make the games more or less N64-like, so not having those features in Forsaken Remastered is a bit of a bummer. So what "is" Forsaken? It is a first-person-shooter set in a post apocalyptic future where players fight for loot and resources in abandoned facilities while fighting off automated defenses, mutated creatures, and rival pilots. The game takes place in full 360-degree environments where you are free to fly around in any direction and attack enemies from any angle. PC gamers would likely call it just a Descent clone, which it was very similar to, but for me as a console peasant (back then and still today, high five!) 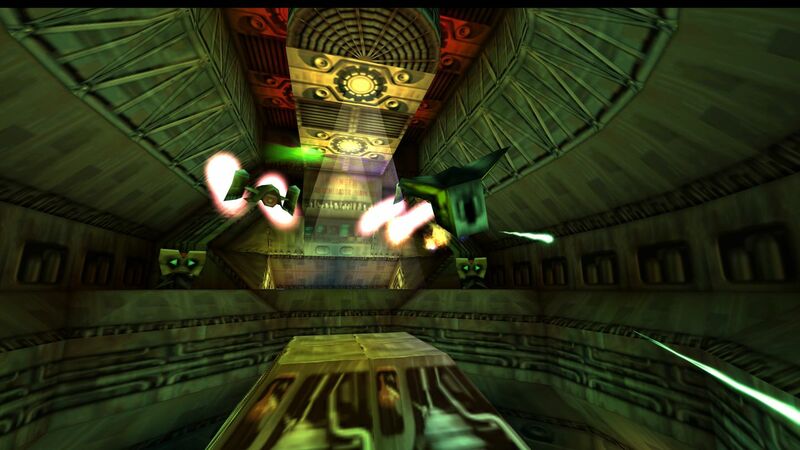 it was a unique game on N64 that was unlike anything I had played before. Forsaken was notoriously difficult thanks to brutal enemies and maze-like levels and that hasn't changed at all. It's still really, really hard but it's definitely enjoyable. The game has a great 3D map system that shows you where you are, but not necessarily where you need to go next and levels that require switches to be pressed or keys to be collected can be a pain because they don't appear on the map so you can spend a lot of time wandering around. Compared to the mazes in Turok 2, however, Forsaken's levels are much simpler and you do figure them out eventually. The gameplay overall is just really fun as flying around feels really great and the variety of weapons and power-ups you pick up as you explore and shoot down enemies is fantastic. It is satisfying and challenging and just a ton of fun and thanks to actually being able to see what you're doing and playing with proper controls, Forsaken Remastered is easily the best way to experience it. The presentation in Forsaken Remastered is solid all around. It still retains that 1998 look and feel but everything is clear and sharp and looks good. Also, to my surprise, it hasn't made me motion sick thus far despite being a game where you fly around in 360-degrees and move around a lot. If that is a concern for you, fear not. I loved the soundtrack back in the day and can happily say all of the music is present in the remaster as well. There was just something about the industrial synth / pop / rock music that really appealed to me, and still does to this day. The mix of ambient tracks with more thumping fast paced music, depending on what level you're playing, is expertly done. What can I say, I just love the Forsaken soundtrack. In the end, Forsaken Remastered is a pretty solid package all around. It looks fine, plays great, sounds awesome, and has plenty of features to keep you coming back for more. Whether you are already a fan of the game from back in the day, or just want something new and unique to play on your Xbox One, Forsaken Remastered is definitely worth a look.